Sometimes images say so much more than we could ever say in words. As I write, on the morning of December 21, the winter solstice has just taken place. In addition to being the shortest day of the year – and the longest night – it marks the moment when the earth is the farthest away from the sun and the first official day of winter. Even though we know what we are in for, weather-wise, our days will be getting a little longer and lighter from here. A lovely thought, yes? 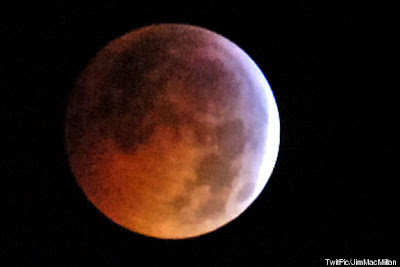 But what made this year's solstice unique, is that it coincided with a lunar eclipse. A complicated confluence of dark interrelating with light. In her blog Rabbi Jill Hammer, Tel Shemesh: Celebrating and Creating Earth-Based Traditions in Judaism (http://telshemesh.org/) she writes that the darkness "is fertile. As the vine of the year climbs upward, the month of Shevat arrives—the time when sap begins to run in the trees (usually corresponding to January or February). In Israel, flowers begin to bloom. According to Hai Gaon, a 9th century sage, in Shevat God throws three coals into the world to warm the air, the water, and the earth. Soon Tu B’Shevat, the festival of trees, will arrive to proclaim that life is running through the veins of the world, warmed by the returning sun." If you have 3 or 4 minutes, click on this link. The footage was taken by a Floridian and posted on YouTube. I particularly liked this because it shows the moon – in brilliant reds – without any words or sound. You can create your own solstice imagery and/or conclusions. Enjoy. Rest our heads on sacred stone. 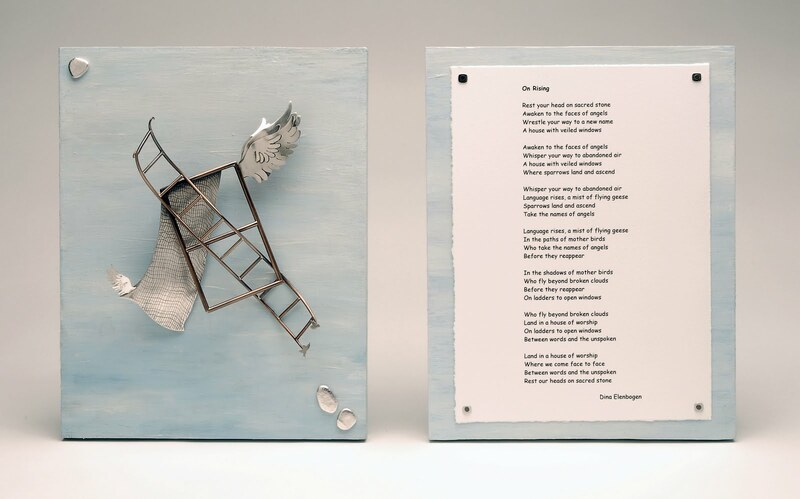 The following snippets are taken from Dina Elenbogen’s words describing the inspiration behind her poem and Jane Weintraub’s sculpture created for Rabbi London’s recent installation. “On Rising is a pantoum, a Malaysian form, popularized by French poets, where the second and forth lines of one stanza become the first and third of the next. The first line becomes the last line of the poem, though slightly altered. I like the momentum that this form offers and hoped the patterns would speak to Andrea’s love of numbers and puzzles. I sent a draft to Jane and watched her amazing sculpture grow out of it. Finally and most significantly, I went back and read about Jacob’s dream of the angels as well as other Jacob moments in Genesis and realized that he would be the central patriarch of the poem and that Moses and Abraham could rise and wander elsewhere. I liked that Jacob was our third patriarch ( and our parsha of installation Shabbat) and Andrea our third Senior rabbi. … As the poem progressed, Jacob’s presence faded into the background but he remained a central force, particularly in the opening line that echoes Jacob falling asleep on a stone before he awoke to angels. In the last line of the poem the “you” shifts to “we,” from the leader to the people, from the rabbi to the entire congregation …The poem continued to go through many drafts but I had to be careful; something as simple as changing sparrows to geese could throw off an entire sculpture. I kept the central images but the language continued to shift until finally and fortunately, Jane set it in stone. On the Friday during Hanukah, just before sundown, Rabbi Israel ben Eliezer – who would later become known as the Baal Shem Tov and a very mystical rabbi indeed - wandered into the nearby forest to meditate among the trees and study the flora and fauna. Just as he was about to return home, a blizzard raged and darkness fell. Rabbi Eliezer struggled to make his way through the storm, but he was lost. He walked and walked, but kept returning to the same spot in the woods. He could not find the path that led back to his home. But because he trusted God, he did not lose faith. He was only upset that he would not be able to light the candles on Hanukah. The rabbi became so exhausted from his struggle that he sat down to rest and fell asleep. While he slept, a tall old man with a candle in his hand appeared. “Who are you,” the rabbi asked. At this, the rabbi awoke and was able to make out the shape of a person in the swirling snow, who was holding a menorah in his hand with one candle burning, one much like the rabbi’s own. Rabbi Eliezer followed this figure and the light coming from the flame. He walked for hours, never letting it out of his sight. Soon he recognized the fields and trees, his own village and then, his house. In the window, was the clear and bright flame from the candle’s light. Rabbi Eliezer understood that Mattathias had removed the menorah from the window and used it to guide Rabbi Eliezer home. He told his wife about his dream – about the silent figure who had guided him through the forest. 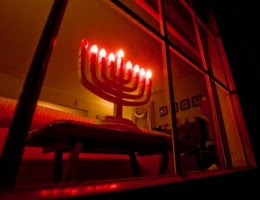 As they approached the house, he rabbi pointed to the window and saw that the menorah had been restored to its place. And the flame glowed brightly in the night sky. All of us struggle with some form of darkness - whether it comes from ourselves or the outside world. Hanukah reminds us not to fight with the shadows but instead, to light a candle and dissolve the darkness. Over the course of eight days, light overpowers the darkness. We can see far beyond the candles themselves. So when darkness looms, Hanukah seems to be saying, make more light. Adapted from “The Enchanted Menorah” from The Day the Rabbi Disappeated: Jewish Holiday Tales of Magic. Tell our your favorite Hanukah story. Or send a link to your favorite Hanukah song or video.